If you're looking to switch up your solitaire game then you might want to try a different version. 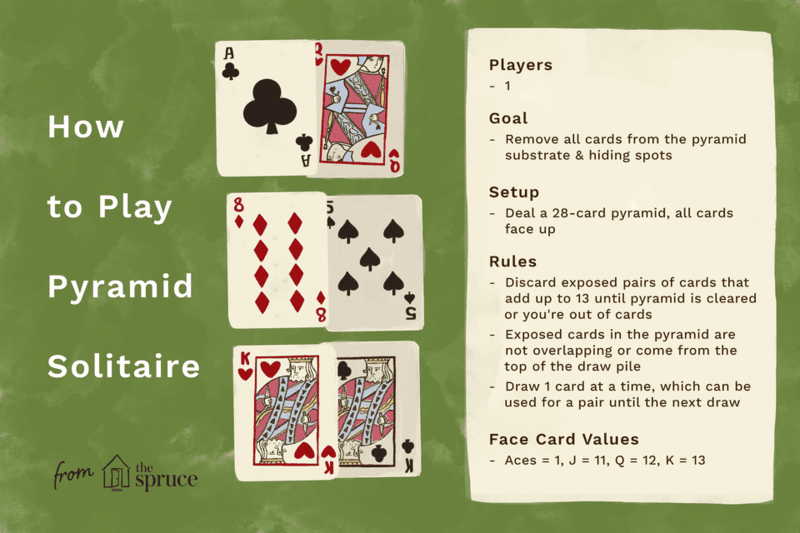 Pyramid is a solitaire card game with very simple rules. It's easy to learn and takes just a few minutes to play each hand. It's perfect when you have just a few minutes to kill. To remove all of the cards from the pyramid. Shuffle the deck. Deal cards to form a pyramid, starting with a row of 1 card, followed by a row of two cards, etc., down to a row of 7 cards. Each row should overlap the previous one. The pyramid will include a total of 28 cards when complete. The remaining cards are set on the table face down to form the draw pile. Reveal cards from the draw pile, one at a time. If a card from the draw pile is not used, it should be covered up by the next card from the draw pile. It can be used later in the game, but only if it gets uncovered because any draw pile cards on top of it are able to be discarded. NOTE: Discarding is always optional, and there may be times when it is a better tactical choice not to discard. Cards in the pyramid are "exposed" if no cards are overlapping them. Only one card from the draw pile is "exposed" at any given time in the game (i.e. the most recent draw pile card to be turned up is the only card from the draw pile that's "exposed"). EXAMPLES: If a 9 and a 4 are both exposed in the pyramid, they can be discarded. If a 5 is exposed in the pyramid and an 8 is exposed after being turned up from the draw pile, they can be discarded. Aces are worth 1; Jacks are worth 11, Queens are worth 12. Kings are worth 13 and can be discarded as a single card. Instead of revealing cards from the draw pile one at a time, reveal them in sets of three. The first set of three is laid on the table to start with three distinct piles. When future draws are made, the three new cards are spread over these three piles. The order in which cards are placed on the piles should remain constant throughout the game. The game ends when all of the cards have been removed from the pyramid or when the draw pile has been exhausted, whichever happens first.